Natures Defense is a non-toxic and environmentally safe animal repellent granule. It is easy to use and applies in just minutes. No specialized applicators or traps required. The dry granular make-up means no mess, unlike liquid or spray pesticides. Granules won't wash away in rain, evaporate, or freeze like liquids do. 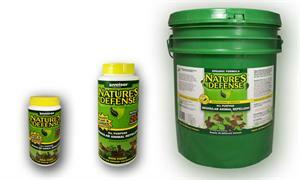 Natures Defense is safe to use around children, pets, plants and food crops. It will not harm the animals you are repelling.